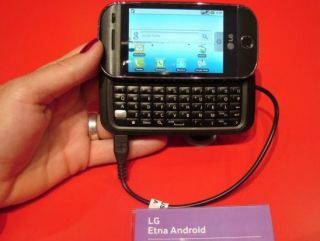 The Etna - LG's first Android? LG's new Android device looks likely to have been outed by Vodafone at the recent IFA show as the Etna KS360. The new phone was spotted by German site Chip Online, and the pictures show a new phone with a QWERTY keyboard and a three inch touchscreen. The new phone will also sport a 5MP camera according to the same site, although no word on whether it will have a flash or not. We've spoken to LG about the phone, and TechRadar was told there 'weren't any further details on the phone'. However when we spoke to Jeremy Newing, head of marketing for LG Mobile in the UK, earlier in the year at Mobile World Congress he told us LG was planning on using Android for social networking-style phones. "We'll be launching several Android handsets in 2009, likely in second half of the year," said Newing. "For Android we have a huge interest in using it for social networking handsets, as these are going to be big pillars of our strategy for 2009." So it seems the promise is coming true with the Etna, although we doubt LG will be releasing 'several' Android handsets this year as it hasn't even officially announced one yet. "We will use Android in different ways, in mid and higher end handsets, with the difference coming through form factor and different application needs for each handset," continued Newing earlier this year. "If you think about where the platform came from, i.e. Google, then you'll see it'll be heavily mobile internet based and designed for messaging." At least the QWERTY keyboard makes sense - although it seems likely this is a more high end phone that LG earlier planned on bringing.